After all, tires are what connect the equipment to the ground, and a tire’s pressure regulates just how much of that expensive horsepower turns into actual pulling power. Here are just some of the ways how operating at proper tire pressure—in the field and on the road—will benefit your business. In general, one of the easiest ways to maximize your equipment's performance in the field is to lower its tire pressure. Tires operating at lower inflation pressures are softer and more flexible, putting more of the tire’s tread on the ground to deliver more traction. Additionally, lowering a tire’s pressure creates a softer tire that flexes more, resulting in better self-cleaning of the tread, which also leads to better traction. Of course, better traction helps reduce slippage, and in the end, equates to better tractive force, productivity and fuel economy. Another value of lower tire pressure in the field is the creation of a more substantial footprint and better flotation. Bigger footprints help distribute the weight of today’s large and powerful farm equipment over a greater surface area, reducing the pressure exerted on the ground by the equipment’s tires and minimizing soil compaction. Lastly, tires running at lower air pressure help reduce vibration, which is useful for the increased longevity of both the machine and the operator. Unlike in the field, tires used on the road typically benefit from being operated at higher air pressures. Higher tire pressure on the road creates less rolling resistance, and less rolling resistance means lower fuel consumption. Additionally, higher pressures result in less tire deflection while being driven on the road, reducing heat buildup and making machinery easier to maneuver thanks to reduced sway and improved cornering. For tires that see equal amounts of time in the field and on the road, the majority of tire wear occurs when being used on the road. Unlike the soft soil found in the field, a road’s surface is hard and unyielding—meaning tires operated at an incorrect pressure in the field can damage the soil, but incorrect air pressure on the road will damage the tire. Adjusting your equipment's tire pressure to suit its application can be done with any tire; simply check the manufacturer’s load/inflation table to ensure you’re within the tire’s recommended parameters. 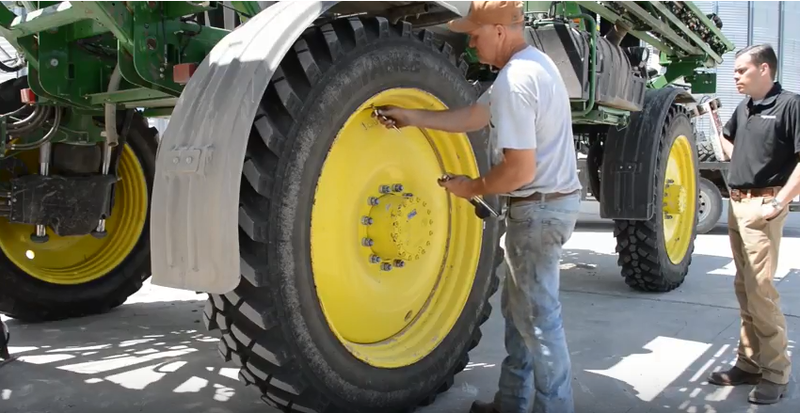 However, IF/VF technology enables farmers to truly take advantage of inflation pressure with their ability to carry 20% to 40% more load at the same inflation pressure as a conventional radial tire, or by carrying the same load at 20% to 40% less pressure. The use of IF/VF technology lets farmers operate their machinery at optimal inflation pressures and unlock the true potential of today's machines. Contact your Alliance Dealer today to make sure you’re operating your machines at the optimal tire pressure—and while you’re speaking with the dealer, ask about Alliance's industry-leading line of steel-belted IF/VF tires and how they can benefit your operation!